Golda Meir, born Golda Mabovitz, (1898–1978) was one of the founders of the State of Israel. 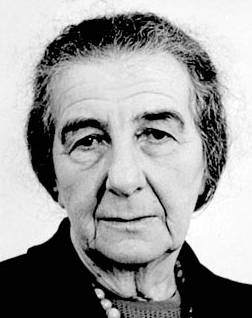 Golda Meir was one of twenty-four people who signed the Declaration of the Establishment of the State of Israel in 1948. She was an Israeli minister from 1949 and was the fourth Prime Minister of Israel from 1969 to 1974. Golda Meir was known as the ‘Iron Lady’ of Israeli politics years before the epithet became associated with Margaret Thatcher; David Ben-Gurion once described her as ‘the only man in the Cabinet’. She was the first (and to date only) female Prime Minister of Israel, and was the third female Prime Minister in the world. Following the 1972 Munich murders at the summer Olympic Games, Meir appealed to the world to ‘save our citizens and condemn the unspeakable criminal acts committed’. She and the Israeli Defense Committee were clearly dissatisfied with the response because she then authorised Mossad to kill Black September and PFLP operatives wherever they could be found (including on the streets of western European cities) – I guess that depending on your point of view you could describe that as either Cowboy justice or state-sponsored terrorism. Sword of Gideon (1986): Tells the story of a Mossad team hand picked to hunt down the terrorists involved in the 1972 Munich Olympic massacre of Israeli athletes. Colleen Dewhurst	played Golda Meir. Marie-Angèle Protat was key makeup artist. 21 Hours At Munich (1976): This movie briefly featured Golda Meir (Else Quecke) during the seige in Munich. Raimund Stangl was the makeup artist.